The first new sub is expected to be delivered to the Russian Navy in 2019. Russia has laid down the first two out of six planned improved Project 636.3 Kilo-class (aka Vashavyanka-class) diesel-electric attack submarines destined for the Pacific Fleet at the Admiralty shipyards in Saint Petersburg on July 28, TASS news agency reports. Russian Deputy Defense Minister Yuri Borisov presided over the keel laying ceremony on the eve of Russia’s Navy Day which saw parades of dozens of warships and submarines in multiple time zones including at Russian naval bases in Sevastopol, Tartus in Syria and Vladivostok in the Russian Far East. “The keel-laying ceremony is taking place on the eve of Navy Day. It is traditional to lay down or float out ships and boats on days coinciding with celebrations. And, most importantly, this is a step towards increasing the country’s defense capability,” the deputy defense minister said. The two improved Kilo-class subs, the Petropavlovsk-Kamchatsky and the Volkhov, are expected to join the Russian Pacific Fleet in 2019 and 2020 respectively. “Hydraulic units have been installed on the first submarine, the Petropavlovsk-Kamchatsky, and it will be delivered to the customer on November 25, 2019,” Admiralty Shipyard CEO Alexander Buzakov said on July 28. Last year, Buzakov was still optimistic that two Kilo-class submarines would be delivered to the Pacific Fleet by 2019. “The term of delivery of the six boats [is] two in 2019, two in 2020 and two in 2021,” he said in September 2016. However, construction of the second submarine appears to have been pushed back. The decision to accelerate the construction of Kilo-class subs was partially made due to delays in the Project 677 Lada-class diesel-electric attack submarine program. Although, the Russian Navy expected to operate three Lada-class subs by the end of 2018, so far only the lead boat of the class has entered service and is currently undergoing operational testing. The Project 636.3 Kilo-class is an improved variant of the original Project 877 Kilo-class design. The updated version is slightly longer in length — the sub’s submerged displacement is around 4,000 tons —and feature improved engines, an improved combat system, as well as new noise reduction technology. The submarine has a crew of around 50 and can conduct patrols for up to 45 days. The improved Kilo-class can fire both torpedoes and cruise missiles, launched from one of six 533 millimeter torpedo tubes. While Project 636.3 Kilo-class subs have been primarily designed for anti-submarine and anti-surface ship warfare, boats have repeatedly attacked land targets with M-54 Kalibr (NATO designation: SS-N-27A “Sizzler”) cruise missiles in Syria. One of the major handicaps of Russian diesel-electric subs remains that they lack air-independent propulsion (AIP). 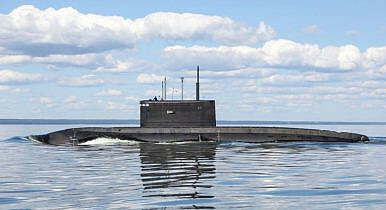 Russia’s Rubin Design Bureau has so far not successfully tested an AIP system aboard a submarine. Russian defense official expect a first AIP system to be available for testing by 2021-2022. Until then, conventional attack submarines will have to rely on existing diesel-engine-based designs. A contract for the construction of six diesel-electric attack submarines was signed this week.